Some things never change: that breathless call to buy was published way back in 1885 (see the entire ad here). Still, the 128-year old praise for the area off of Shaw and Queen Street West still holds true today. Though Bellwoods Park remains “picturesque,” we’d wager it’s far too crowded on weekends for carriage rides. 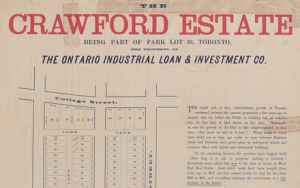 We’ve mined the archives of the Toronto Public Library to bring you antiquated real estate ads from some of the city’s most popular, hard-to-buy-into neighbourhoods. Enjoy! What’ll you get when you buy into Yorkville Village? No, not a luxe condo in the sky, but a fairly humble looking detached home. 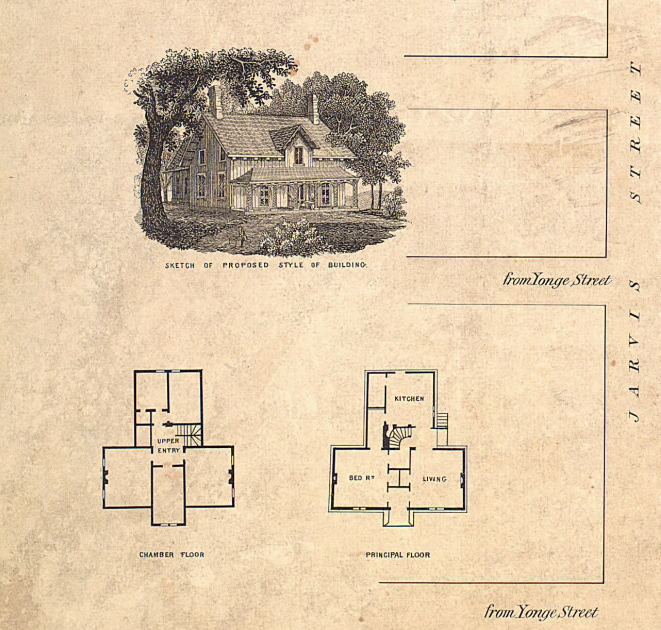 Check out the rendering and floorplans for the proposed properties (circa 1855). Full plan of neighbourhood here. 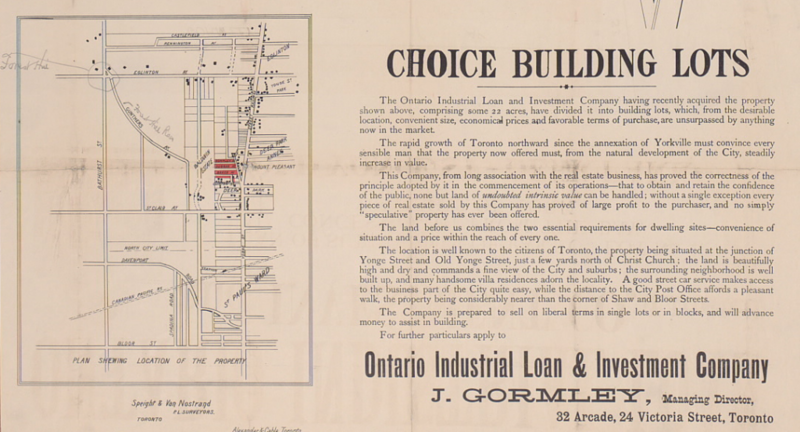 Looks like easy access to public transit was always a big draw for buyers, even at the turn-of-the-century. 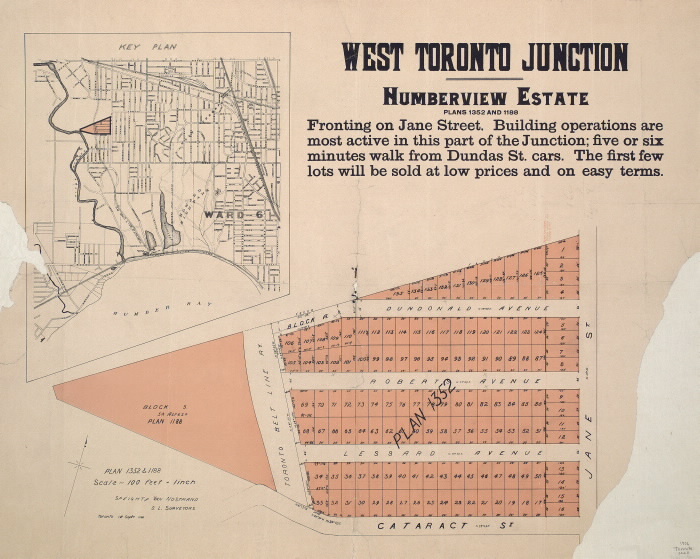 In 1906, the first buyers into the western flank of The Junction could enjoy the “five or six minutes walk from Dundas St. cars.” Seems like pre-construction deals were always an incentive too. The Humberview Estates promises “the first few lots will be sold at low prices and on easy terms.” See the full listing here. Live off of Bathurst Street with only 10 per cent down! Sound familiar? That’s because the particular payment plan has been around since 1853. 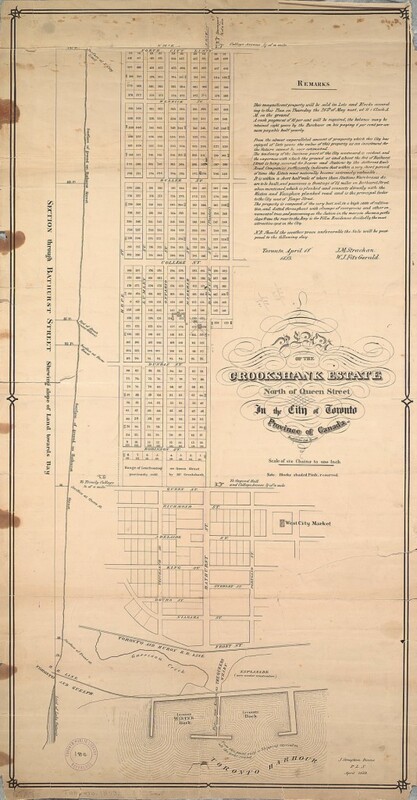 The copy for The Crookshank estate, north of Queen and just off of Bathurst, notes that a “cash payment of 10 per cent will be required.” It goes on, suggesting that “the value of the property as an investment for the future cannot be over-estimated.” See it in full here. The southwestern development known as West Point had so many monikers in 1909: “Muskoka of New Toronto” or, our favourite, “Toronto’s New Health Suburb.” The lakefront community promised a “delightful view, invigorating air and the aquatic pleasures of Lake Ontario.” And it was perfect spot for harried captains of industry too: “The city business man can secure here all that Muskoka gives – and yet be near enough to the city to keep his hand on the pulse on the city’s business activities.” Sounds like Torontians were workaholics back then too. Read it in full here. 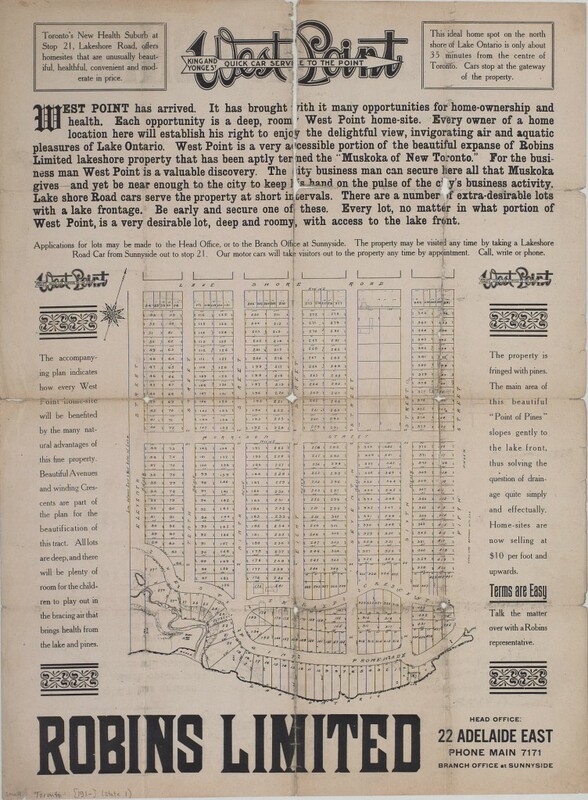 “The land before us combines the two essential requirement for dwelling sites – convenience of situation and price within the reach of every one.” It may be wordy, but this 1885 ad for the Deer Park area plays up the all-important convenience factor. The post office must have been the 19th century equivalent of a neighbourhood amenity. See the full map here.